It's October and the B-Movie Geek, Doc Manson, is back to take the #Shocktober challenge! The quest? To watch 31 horror movies in the 31 days of October. Tonight I'm here to review Annabelle, movie #9 of my October Horror Movie Challenge. I decided to request the Bluray of Annabelle from the mail-in Netflix service because I really enjoyed The Conjuring (2013). The Annabelle doll was present as an ominous presence in that film, an ever-looming threat lurking within the home of the protagonist paranormal investigators, The Warrens. 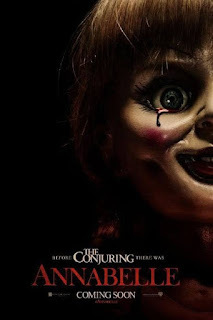 In the context of The Conjuring, Annabelle was a secondary antagonist, existing separate from the main storyline and thereby providing a richness to the universe within the film. This shouldn't be surprising, I suppose, given that The Conjuring was based on a true story and that the aforementioned protagonists, the Warrens, are a real life husband-wife paranormal investigation team. 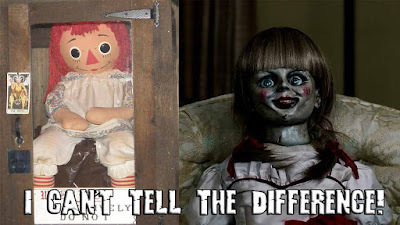 The Annabelle doll is likewise teal and is currently stored in the occult museum located at the Warrens' house in Monroe, CT. For posterity, here is a comparison image of the Annabelle doll used in the movie and the one from the real life case. OK, so why have I spent two paragraphs talking about The Conjuring in an article about Annabelle? Mostly because The Conjuring is a superior experience, filled with a lush sense of period and presence. 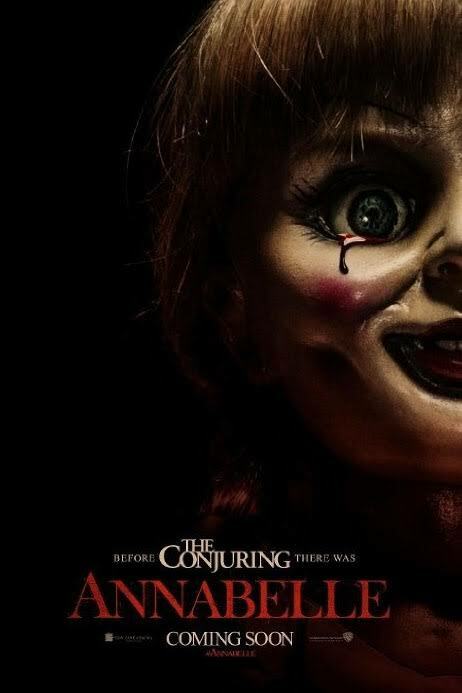 Meanwhile, it's psuedo-prequel, spin-off, Annabelle, feels like a hollow, horror movie simply checking off the boxes that some Hollywood business executive dictated needed to be covered in a film about a demonic haunting. 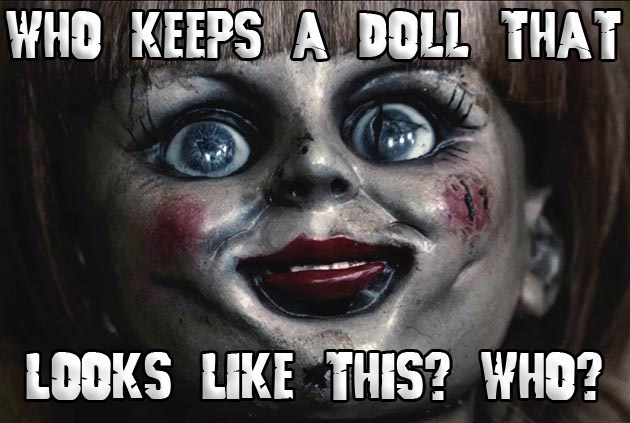 The film takes a lot of license with the true story of Annabelle. The film is bookended by scenes taking place in more modern times, in which a two female roommates talk about some strange occurrences revolving around the doll. The bulk of the film, however, goes back in time to tell the origin story of the doll. In the film, the estranged daughter of two mild mannered suburbia folk falls into some sort of satanic cult. For some reason, the daughter returns home with her cult-following boyfriends and murders her parents. Then, the daughter and boyfriend go next door to try to murder the neighbors. In the middle of this second attempted murder, the cops show up and shoot the boyfriend dead. The crazy cult daughter goes into a room filled with a collection of dolls, picks up Annabelle, commits suicide, and after she dies some of her blood happens to fall into the doll's eye socket, which I guess counts as some sort of binding ritual that attaches a demon to the doll. Can we talk for a moment about how none of this makes any sense? Like, not even Hollywood movie sense. The cult daughter has no reason to target the neighbors, either for murder or for haunting by a demonic devil doll. I'll accept at face value the daughter returning home to kill her parents, but I'm not sure how that act in anyway relates to their plan to attach a demonic presence to an inanimate object. Unless, the cult couple's plan was to kill the parents, and the doll demon-ritual was an after thought borne out of desperation right before the daughter's death? I mean, if the goal was to call forth a demon to possess a doll with a demonic presence, why didn't the cult couple complete this ritual when they were murdering her parents? If the daughter only needed to commit suicide to link the demon to the doll, why did they murder anyone? How did the daughter know that, after she was dead, that her blood would fall exactly as it was needed to possess the doll? Why did she decide to send a demon after the neighbors only after failing to murder them? Why not just send the demon after them in the first place? No matter how I look at this, I don't really understand what the goal or thought processes might have been leading up to the moments where the Annabelle doll is linked to the demon. There is no attempt at any point to provide motivation for this cultists' actions, and I get the vague impression of a Hollywood suit somewhere telling a frustrated screenwriter, "They're cultists and they just do evil demon stuff! Enough said!" I suspect that my sense of disjointedness in the storytelling is also because the bulk of the film is pure fiction created by the screen writers. 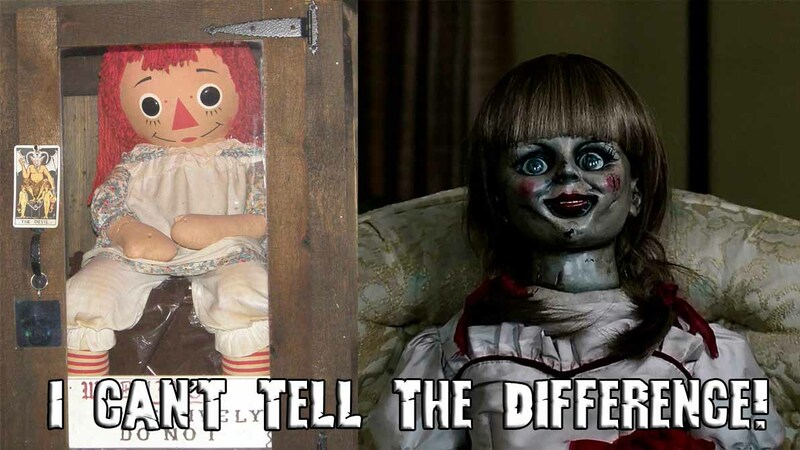 Only the bookend scenes, you know the scenes lasting maybe 3 minutes of screen time, are actually based on the true story of the Annabelle doll. I don't know why the filmmakers chose to completely invent a story for the doll instead of retelling the actual true story, but I guess this leaves the film open for a sequel with a minimum need for creativity? Everything that happens after the doll origin sequence deals with the demon trying to claim the soul of the protagonist neighbor lady's baby. Except, in the logic presented by the movie you can't just take a soul, it has to be given. Also, a baby's can't give their soul away, so, TWIST, the demon was really after the mom's soul the whole time. Since the demon needs mom lady to freely give her soul, the demon messes with the baby a whole lot to make the mom crazy enough to offer up her soul to protect the baby? I don't know, demon logic seems complicated. In the end, this prequel felt like a paint by the numbers horror experience, lacking the real world grounding of its predecessor. It's not very scary, and the demon seems to just do demonic stuff because, hey, it's a demon.